Real Estate News - Lake of the Ozarks Shootout! 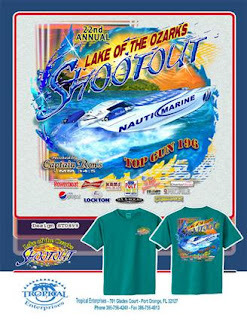 It's that time of year again, and for Lake of the Ozarks the Shootout is just about as good as Christmas! Fran Campbell Team wishes to welcome all of the Shootout Fans and wants you to enjoy your weekend with us. If you haven't already, click HERE for the most up to date schedule of events. If you are coming to watch the races, here a few tips to keep you having a great time and safe! *The two-mile bluff-shaded stretch of the Lake that makes up the Shootout course will be designated with a racing channel, a buffer zone and a viewing area, with a local traffic channel along the shore. But note, none of these areas are very wide. *If you're really interested in the racing, watch how they start. Last year, the course had a slow start. This year it's going to be faster. That is telling of the ultimate finish time. The Process: Automated valuation methods (AVMs) are online programs that use public home sale records, demographics and property characteristics to find your home’s value. You key in your home’s information, like the location, square footage and number of bedrooms and bathrooms, and the software returns with an estimated value. Pros: AVMs are quick and easy, and many are free. AVMs are a great way to watch trends in value, because they gather statistics from public records. These are the "Good Old Days" that we will remember. Did you read that correctly? Yes. Although there is still high unemployment, dissatisfaction with elected officials at every level, and concern about global debt, these will be remembered as the "good old days" to purchase a home. The combination of historically low (and artificially maintained) mortgage interest rates, and the incredible price of most real estate, has never been seen before. We have had low interest rates before, but housing prices were high. We have had lower housing prices, but interest rates were above 10%. This is the only time we have had the "perfect combination." Lower interest rates give a buyer a type of instant equity in a home, even though the price of the house is lower than it had ever been before. Remember, when interest rates go up, you can buy less house (you qualify for a smaller loan amount).